Do you have little guests coming to your Thanksgiving dinner? Are you looking for ways to keep the kids entertained while you cook the Thanksgiving dinner? Then your search ends here. Thanksgiving is one of the major holidays of the United States. It is celebrated on 4th of November every year, thanking the Almighty for blessing people with a plentiful harvest. 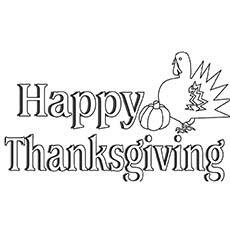 Thanksgiving has been celebrated as a federal holiday every year since 1863. 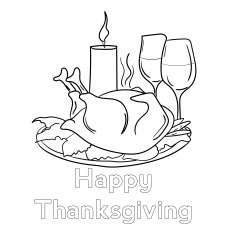 Here is a perfect Thanksgiving coloring sheet for a fun holiday activity. This coloring sheet will make a great decoration to hang up during the holidays. It will add a festive touch to your overall decoration. It will also reinforce reading skills in your children. This Thanksgiving coloring sheet will help your child learn about the origin of the holiday and all that it represents. The illustration features a Native American planting corn. The first Thanksgiving was celebrated by the Pilgrims after their first harvest in 1621. The three-day-long feast was attended by 90 Native Americans and 53 settlers. Children will surely have a great time learning about the history of the first Thanksgiving. This coloring sheet features Thanksgiving’s iconic bird-the turkey. This bird, with its puffed up chest and lots of feathers, is waiting to be colored with some deep fall colors. Turkey is the main dish of a Thanksgiving dinner. Thanksgiving is also called “Turkey Day” fondly by the Americans. The wild turkey is the native of North American. Benjamin Franklin, one of the presidents of the United States made turkey the national bird of the United States. It is one of the probable reasons for the inclusion of turkey at Thanksgiving dinner. Here is a cute, little turkey waiting to be colored. 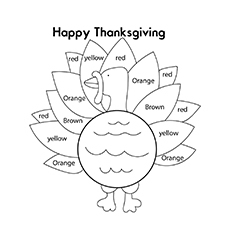 Tell your child to give color to this turkey according to the listed color. It will surely get her excited about the Thanksgiving. This free printable thanksgiving coloring sheet will help your child recognize the numbers and learn the importance of coloring instructions. Hang the finished work on your fridge’s door. It will make the refrigerator look very appealing. Thanksgiving is a time to thank God for all the things we have, and if you have a basket full of food like this, then you have a plenty to thank Him. The cornucopia, also known as “the horn of plenty” is a symbol that represents the harvest during Thanksgiving. 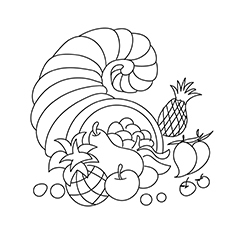 This particular cornucopia is brimming with foods like grapes, apple, pineapple, and pear. Can you ask your child what all can he find in this “horn of plenty”? Thanksgiving is all about yummy food just as you see in this coloring sheet. This Thanksgiving coloring sheet features the trimmings of a traditional holiday meal. Can your child name the different foods he sees in this coloring sheet? Children will get a taste of fall as they color the sheet. As your child colors, ask him what delicacies will he prefer this year for the Thanksgiving holiday. This thanksgiving color pages will get your child in the festive mood. 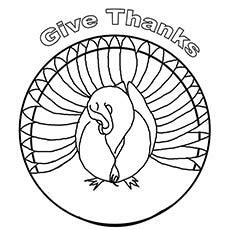 This mandala features a fluffy turkey arranged in a circular shape. You can hang this sheet above your mantelpiece, in the front hallway and across the dinner table to spruce up your house this Thanksgiving. Crown your Thanksgiving dinner table with a centerpiece made by your little one. It features a dapper turkey all set to rock the Thanksgiving dinner. Your child will not just have a great time coloring this little person, but will also feel proud seeing his creation gracing the table. Celebrate the friendship between the pilgrims and Native Americans with this coloring sheet. 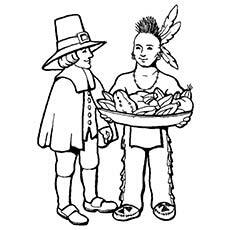 The coloring sheet illustrates a Native American sharing a food with Pilgrim. Use this coloring sheet to start a conversation with your child about the story of the first Thanksgiving. What is Thanksgiving all about? It is about spending the day with friends and family. Teach your child about this important message with this detailed coloring sheet. This coloring sheet shows the pilgrim family serving sumptuous turkey to the Native American. It perfectly captures the essence of Thanksgiving- sharing and enjoying with family and friends over a meal. These cute turkeys are perfect for the little bird enthusiast in your house. It is a great way to get your child ready for the Thanksgiving holidays. It features one turkey dressed as the pilgrim and the other dressed as Native American. Can your child guess what these turkeys are dressed up as? This free printable thanksgiving coloring pages shows a pilgrim kneeling down and praying to God for a safe journey. The pilgrims or settlers departed from Plymouth and arrived at the Cape Cod with the intention of establishing a new colony in North America. Most of the pilgrims fled Mayflower because of persistent religious persecution. Some of them were hired as servants or farmers by the London merchants while the rest decided to go ashore. Since it was winter, the settlers made an unfortunate decision to stay aboard until the spring. A contagious disease took the lives of almost half the pilgrims. Out of 101, only 53 survived. The remaining colonists then went ashore in mid-March. 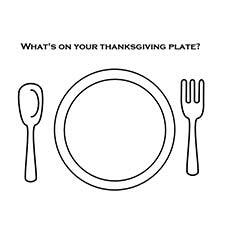 Rolls, mashed potato, turkey, and pie are typical foods of Thanksgiving, but many families add delicacies from their region and culture to their Thanksgiving feast. Children can use the empty plate as a canvas to draw and color a delicious meal. We are sure your child will have a blast recreating what she wants on her plate. This coloring sheet is also a great way to teach your child about the food groups and the nutrition they provide. 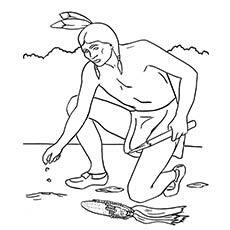 This coloring sheet celebrates the relationship between the early settlers and their Native neighbors. It shows a little Native American girl teaching a pilgrim boy how to throw a boomerang. Both settlers and Native Americans celebrated their first Thanksgiving with much joy. Their meal consisted of roasted meat, corn, shellfish, deer and pumpkin, far from today’s traditional feast. They played ball games, danced and sang the entire night. Unfortunately, the peace between the settlers and Native Americans lasted only for a generation. Welcome the season of eating and sharing with this Thanksgiving coloring sheet. It features gourd, tomato, radish, carrot and other vegetables that grow best during the fall. 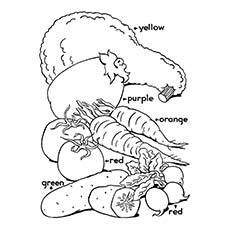 Tell your child to color in the vegetables according to the colors assigned. The first Thanksgiving was held as a celebration of a plentiful harvest season. This coloring sheet may also inspire you to make your own Thanksgiving feast. Nothing says Thanksgiving more than a big turkey. It looks like this cute turkey looks all ready for the big day. This coloring sheet is not just fun, but is also detailed enough for older kids who love to color. It will be a great exercise for his fine motor skills. 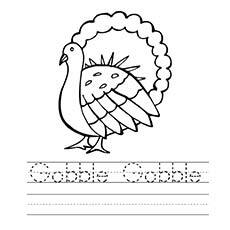 Make sure your child traces the words that spell “gobble gobble”. It will strengthen his handwriting skills. 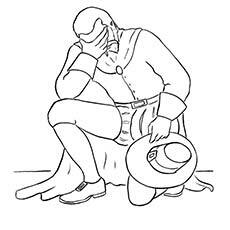 Here is a great coloring sheet to jumpstart a lesson about people who helped the Pilgrims through their first winter in Northwest America. 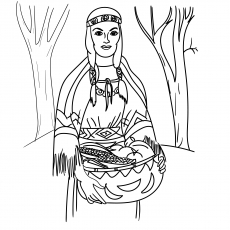 This coloring sheet shows a Native American woman carrying a bounty of Thanksgiving harvest. Do you know who the Native Americans are? The east coast area of the United States was initially inhabited by Native American tribes for more than 12,000 years. The native Americans knew their land well. They were adept in hunting, fishing and harvesting. Share all these facts with your child to make his coloring session more interesting. This coloring sheet shows a Pilgrim landing on the east coast of the United States. This Pilgrim embodies the spirit of Thanksgiving, right from the buckle on his hat to his boots. As your child colors, regale him with the story of the first Thanksgiving. Pilgrims or settlers were a group of English Protestants who wanted to get away from the Church of England. A ship carrying 101 people arrived in the United States after 66 days of traveling. They intended to land where the New York is presently located, but due to windy condition, the group cut short their trip and settled at what is now called the Cape Cod. 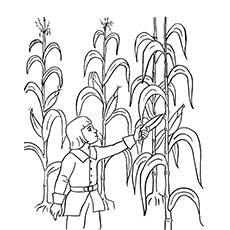 Bring out the colors of Thanksgiving with this corn maize coloring sheet. Maize, also known as corn is a symbol of Thanksgiving. This coloring sheet is a great way to talk to your child about the seasons and how it affects the harvest. This coloring sheet features the deliciousness of the sumptuous Thanksgiving dessert. 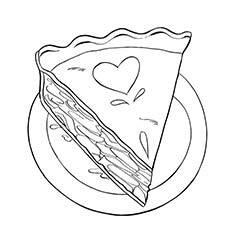 If your child loves pumpkin pie, then he will surely enjoy coloring this sheet. Instruct him to use ivory color for the whipped cream, golden brown for the crust and orange for the pie. This pumpkin pie-coloring sheet will make a perfect post-Thanksgiving dinner activity along with a slice of pie. Tell your child to work up an appetite with this Mickey and Minnie Thanksgiving coloring sheet. 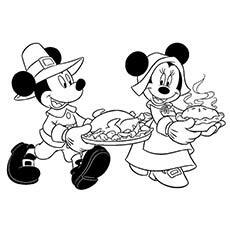 It looks like Minnie has prepared a wonderful Thanksgiving dinner for Mickey and his friends. Mickey and Minnie Mouse are an inseparable duo. They spend most of their time together, having fun. If your child is good at drawing, encourage him to make their other friends on the side of the coloring sheet. 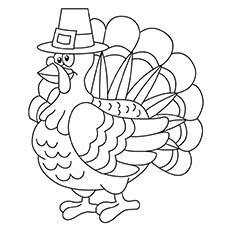 Here is a fun thanksgiving coloring page to keep your child busy during the Thanksgiving. Tell your child to rearrange the words to form a sentence. Then he has to fill colors in the drawings. This coloring sheet is ideal for Sunday School classes. Children can write their name on top of the sheet and then submit to their teacher. Teachers can also pin their work on the class’s soft board. While your child colors the sheet, she will be getting reading practice at the same time. 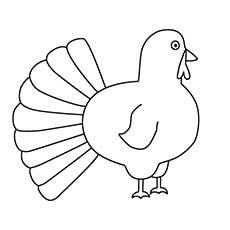 Here is a simple turkey coloring sheet to get your child into the holiday spirit. Don’t you think this turkey is too cute to eat? The bold lines of this coloring are perfect for the little hands to color. Practicing within the lines will also strengthen his small finger muscles. 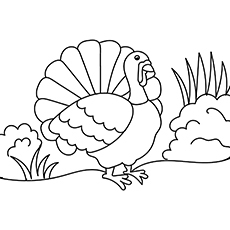 This sweet and simple turkey-coloring sheet will look great as a Thanksgiving décor too. 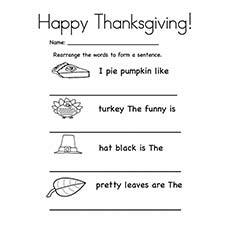 Help your child celebrate the roots and origin of the Thanksgiving holiday as he colors. 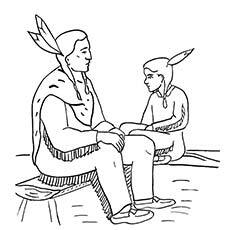 This coloring sheet features a happy Native American father and child spending some quality time with each other on the Thanksgiving day. 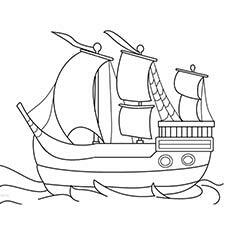 This coloring sheet features the Mayflower ship. Mayflower was the ship that transported Pilgrim or settlers from Plymouth in England to the New World in 1601. This voyage is an iconic symbol of Thanksgiving. There were around 101 passengers while the crew was estimated to be 30. 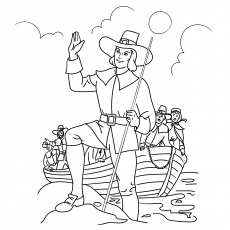 Use this Mayflower coloring sheet to teach your child about the first European settlers in America. Hang this picture in your child’s room when he is finished. 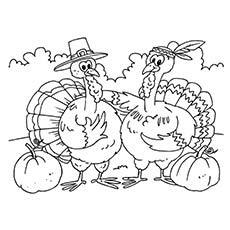 These coloring sheets will make quick and simple activity for your children at Thanksgiving. It will help your child practice academic topics like history, math and reading besides coloring. It will also teach children to respect their country and its cultures from a young age. 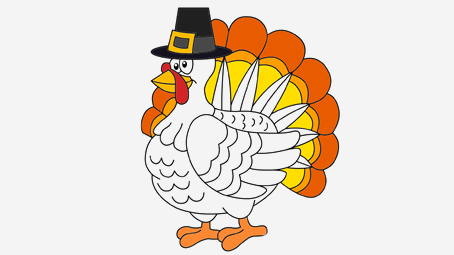 Take out some time from cooking to help your child color these Thanksgiving coloring pages. It will give you the much-needed relaxation before you continue along with your busy schedule.